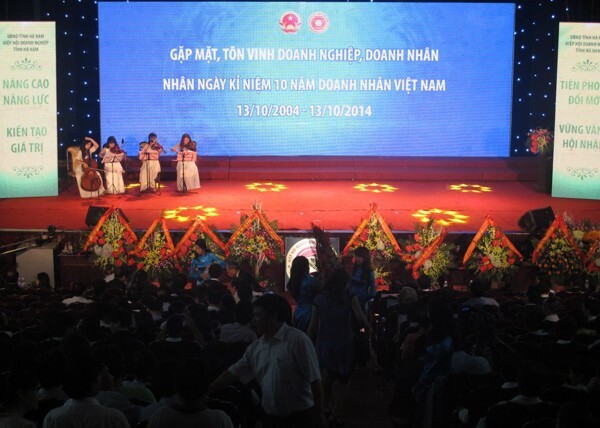 Celebrating 10-years Vietnam Entrepreneur’s Day (October 13, 2004 – October 13, 2014), People's Committee of Ha Nam Province and Ha Nam Business Association organize Ha Nam Entrepreneur Festival to honor enterprises and entrepreneurs in the province. Attending the festival is the participation of Chairman of Vietnam Chamber of Commerce and Industry (VCCI) – Mr. Vu Tien Loc, Secretary of Ha Nam Party Provincial Committee - Mr. Tran Xuan Loc, Chairman of People’s Committee of Ha Nam Province – Mr. Mai Tien Dung, leaders of departments, and leaders of businesses in the province. As the one of the pioneers laid the foundation of construction and development of Dong Van industrial zones in Ha Nam, TrungThanh have built a modern factory with area total of 40,000m2. Acknowledging the great contribution of TrungThanh, leaders of Ha Nam province would like to send an invitation to Mr Phi Ngoc Chung, Chairman - General Director of TrungThanh, for attending Ha Nam Entrepreneur Festival as a guest of honor. At night of exchanges, Chairman of VCCI – Mr. Vu Tien Loc has a speech in which highlighted the spirit of overcoming difficulties in production of Ha Nam’s businesses. For examples, TrungThanh, with the leading of Mr Phi Ngoc Chung, has the correct direction in construction and development over 19 years to become a leading food company in Vietnam. Moreover, the current TrungThanh’s products were exported to the international market, available in more than 50 countries and around the world. He expressed his pride when traveling abroad can see our traditional food on your country. According to Mr. Vu Tien Loc, the patriotism realized by TrungThanh is creating high value products to affirm foothold in domestic and foreign market. Mr. Vu Tien Loc also shows that Ha Nam ranks 10th in attracting investment in the country as well as foreign country. In the future, he suggests that Ha Nam’s enterprises should have many regional products of the province and the country in the market. 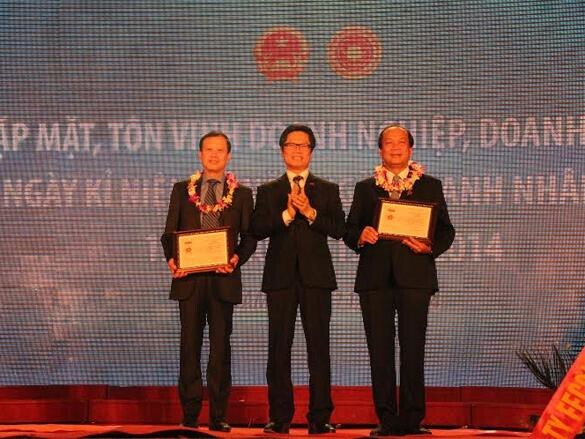 At the festival, VCCI has awarded a medal of "For the development of the business" for Chairman of People's Committee of Ha Nam city – Mr. Mai Tien Dung and Chairman of Ha Nam Business Association - Mr. Dinh Van Hong, has awarded merit list for 20 companies and 10 typical entrepreneurs who have outstanding achievements in economic development of the province. On this occasion, People's Committee of Ha Nam city has also given emulative flag for 9 excellence business as well as merit list of Chairman of People's Committee of Ha Nam city for 37 businesses and 40 typical entrepreneurs. In the framework of the festival, TrungThanh also finances and donates hundreds of gifts for representatives, entrepreneurs, enterprises attending the program.